President Trump has created a new regulation which takes on an important issue. The regulation will be allowing employers to refuse birth control coverage through insurance to their employees. Many people are protesting this new regulation. Under the Affordable Care Act, women are guaranteed access to free birth control. Companies who disagree with Obama’s regulation have problems with providing birth control because of religious or moral beliefs. Conservatives and religious groups are the main groups who support Trump’s stance on the topic. Many women and women’s rights groups are protesting. The federal court has issued a junction that will stop Trump from being able to limit the access that was guaranteed under the Affordable Care Act. The block was made by judge Wendy Beetlestone in Philadelphia. 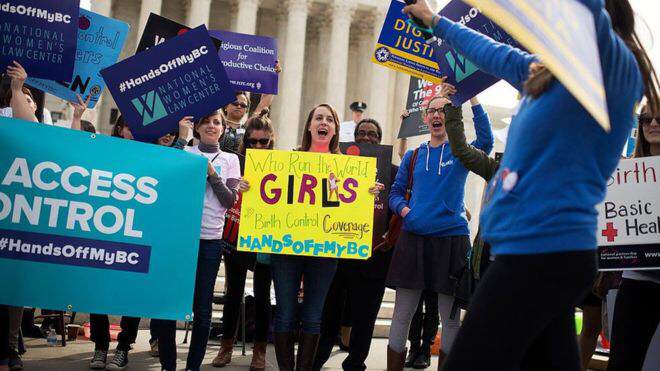 It was estimated that this ruling would cause around 70,500 women to lose coverage to birth control. Before Judge Beetlestone, Judge Haywood S. Gilliam Jr. blocked the regulation for 13 states and the District of Columbia. If not for the block, millions of women would be at risk for losing coverage for birth control if they cannot afford it out of pocket. Many argue that insurance and employers should not have control over such a personal health choice. Birth control is used for many reasons, not just to prevent having children. It lessens the severity of cramps, anemia, and PMS. Without birth control, many women would struggle with these side effects.